Eliot Ness. A brave man indeed. After a recent story in the news about Eliot Ness I finally decided to say something about the man. The story was somewhat condescending towards Ness, a man who is no longer there to defend himself. Of course, the bashing was done by the usual clueless people. Politicians and a self serving author. Was Ness the man they portrayed in the Hollywood movies and televison shows? No, but neither was Capone or any other historical figure for that matter. Today, I simply can't watch Boardwalk empire because of the made up stuff and the sad part is the viewers who have no clue accept everything that is presented on that show as fact. The show's makers stated they didn't use Enoch "Nucky" Johnson's real name because by using "Nucky" Thompson they could invent fictional events!! How sad! The truth was just as exciting and the viewers would have been learning while watching. No money in telling the truth I guess! 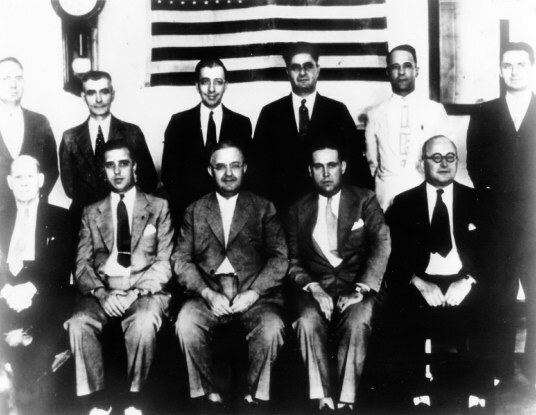 Eliot Ness far right standing and fellow agents 1933. 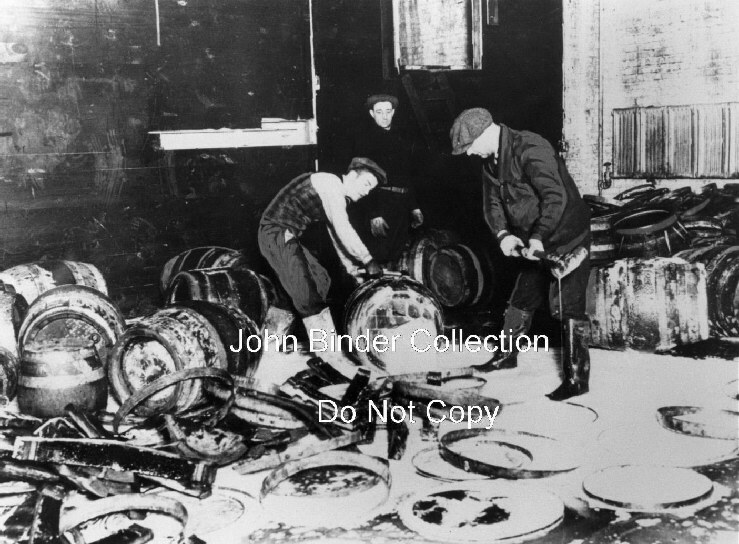 While the investigators were endeavouring to unearth evidence regarding Capone's income tax, another group which Mr. Johnson termed the 'District Attourney's Squad' was investigating Al's beer racket." he said. "This squad from the district attorney's office was led by a very capable young man by the name of Ness, who is a graduate of the University of Chicago and he selected the squad. The plan was to cause the Capone gang to lose money, and this squad took brewery after brewery and something like thirty five of those very large expensive trucks that cost $4000 or $6000 each. They developed a system of detecting those violations and they pursued that relentlessly. (Chicago Tribune April 3,1932). Eliot Ness behind the wheel with two agents. Here is just a small glimpse of a real man. A man who did his job honestly and after being forgotten was approached by an author to sensationalize his story to make profit. Ness felt uneasy, but after years of switching jobs and no longer feeling the same like his past glory days he decided why not? Who out there does not want to be recognized once and a while? Who does not want a chance at that brass ring? I won't go too indepth here and I will touch just a few key points on the man's life. Further reading on Ness should be sought out in these two fine books. What are the facts about this man? Fact; He and his band of chosen agents raided and knocked down Al Capone and other rival gang's brewmaker's operations. They seized equipment, trucks, booze, money. They put a huge financial dent into Al Capone's empire. So bad so, that Al found his financial situation drained. Al no longer ran his soup kitchens, and handed out money like candy. He now saved the remainder of his money for his high priced lawyers to get him off the hook. This, in hopes of defending himself in the tax trial that was eventually to take him for a long ride into being a forgotten man of the past. 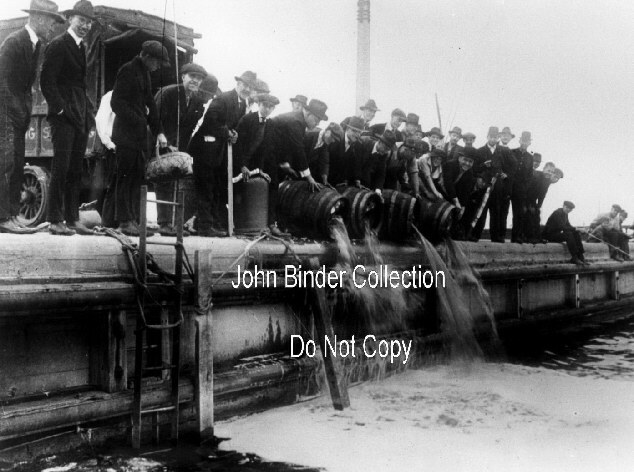 In June 1931, it was reported that during a ten year period 1921-1931 it was estimated through receipts that $200,000,000 was made through the booze combine. The booze could be detected easily by using ones nose on a humid day. Each Capone brewery had a capacity of 100 barrels of beer a day and the Capone gang was charging $55 a barrel. 217 East 30th Street, 337 West 31st, and 3540 South Morgan Street. Some Untouchables having at it at a couple of barrels. 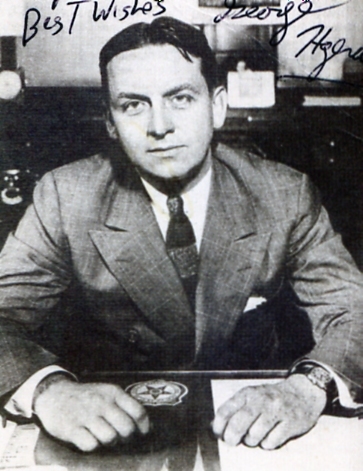 Eliot Ness and his men had accumulated 5,000 counts of prohibition offenses against Al Capone and 68 of his hoodlums. The Government, leaving no stone unturned, also had th IRS prepare at the same time an intricate tax case against Capone. The President wanted Al Capone put behind bars at all costs and so all avenues were looked at. From prior experience they felt that getting Al Capone just on booze charges would somehow let him slip through from facing any serious prison time. Beer dumped in the river. Sadly, after all Ness' and his men's hard work, the Government simply thanked Ness and informed him that they would rather go with nailing Capone on income tax evasion. This, they felt would put Capone away for good and making him an example for other aspiring criminals and that something was finally being done about the "Chicago problem". Ness was disappointed but still felt part of bringing Capone down and justly so. He and his men were potential targets for gang violence on a day to day basis. No one dared cross Capone or his combine. Police, reporters, entertainers were not immune to violence. No one was untouchable to gang violence. A politician was murdered, Jake lingle a reporter was murdered, Police were shot an killed by gangsters, Judges homes were blown up. This was serious business,very real. Ness and his men knew it. Paul Robsky, the ex Untouchable had a different view. He stated that they were in no immediate danger because supposedly Al Capone had put out a strong edict to his underlings to let the Feds do their jobs unhindered. 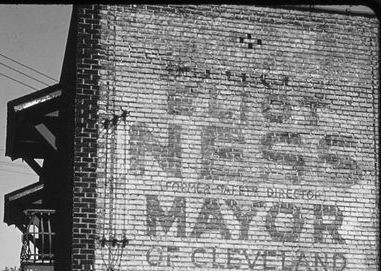 Eliot Ness' name on a side of a building in Cleveland circa 1973. Even with their bestowed name of "The Untouchables" Ness and his men were bribed, ( once up to $50,000). They were also threatened with death. Many claimed over the years that Ness was a publicity hound. I think this is overly exaggerated. I would guess not any more than Al Capone. Eliot wasn't dumb. He knew his efforts had to make a difference and to do so he needed to make sure that people out there knew that. What better way to use the press to counter what was published about gangsters and corruption on a daily basis? His newly formed dept. funded by the public needed to show that their money was well spent. That they were making a difference in the fight against crime! Did Eliot Ness ever meet Al Capone? No, he didn't, but he did partake in transporting Capone to his last train ride to the Atlanta penitentiary. May 4,1932 at 10:01pm the procession leading Capone to the Dixie Flyer began. 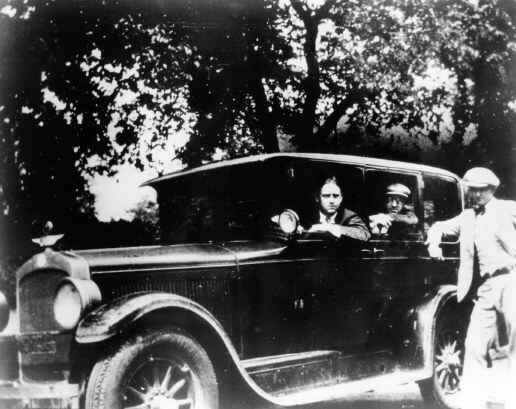 In the lead car (before Capone's car) were Chief Deputy Marshal Joseph O'Neil, Prohibition Agent Eliot Ness and two other dry agents. (Chicago Tribune may 4,1932). 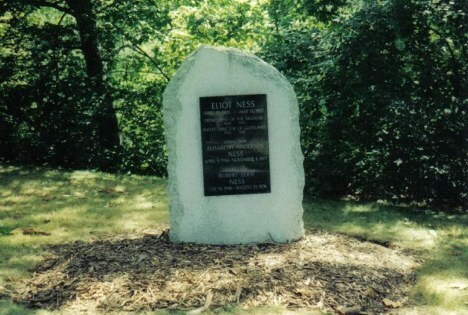 Eliot Ness was born in Chicago on April 19,1903 to Norwegian immigrants Emma and Peter Ness who ran a bakery. Eliot excelled in school eventually obtaining a degree in economics from the University of Chicago in 1925. Ness found employment as a credit investigator for the Retail Credit Co.which the main office was based in Atlanta. He returned to University to take a criminology course of which he obtained a Master's Degree. Ness' brother in law was Alexander Jamie. He taught Ness how to shoot a gun and helped influence him to join the U.S. Treasury Dept. in 1927. Alexander Jamie. Eliot Ness' brother in law. After the Capone era (1933), Ness was transferred to Southern Ohio, Kentucky and Tennessee as an Alcohol Tax Agent. In 1934 he was sent to Cleveland,Ohio. There in 1935 he was hired as the city's safety director. Ness was confronted with a killer among the homeless squatters. No one was ever brought to justice for the infamous Torso murders. By then, his drinking became heavy and his first marriage failed. After his initial success in Cleveland, Ness married again and moved to Washington D.C.in 1942. He worked there as a Health safety director. (Venereal disease was rampant amongst military bases). 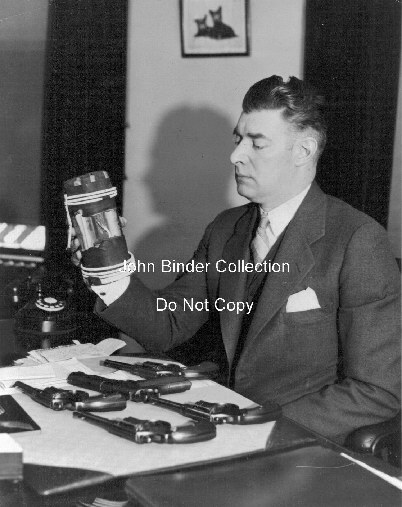 In 1944, he left for Ohio and worked for the Diebold safe company. Divorced and remarried In 1947, (the year of Al Capone's death) he unsuccessfully ran for Mayor of Cleveland. 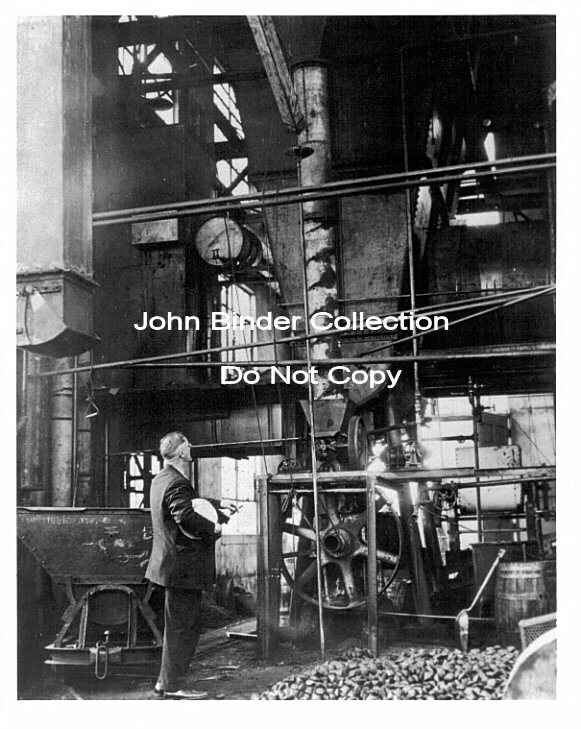 1951 he was expelled from Diebold and later ended up in Coudersport, Pennsylvania working for the Guaranty Paper company specializing in watermark and anti counterfeiting. Ness was human. He was drinking and womanizing excessively. While inebriated he had once been involved in a hit an run. His drinking didn't lead him into trouble all the time because it was while drinking in a bar that Ness has a chance encounter with writer Oscar Fraley, who decides to write up his life story. While Ness was known to embellish some of his exploits, Fraley took it to the hilt! Unfortunately, Ness did not see the book to fruition. On May 16, 1957 at age 54 Ness died from a massive heart attack, this a month before "The Untouchables" was published. Eliot was married three times, Edna Staley from 1929 to 1938, Evaline Ness from 1939 to 1945, and Elisabeth Andersen Seaver from 1946 until his death in 1957. Ness had an adopted son named Robert. 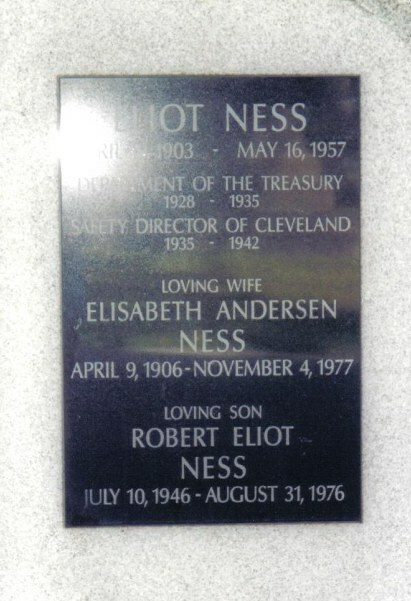 On September 10, 1997, the ashes of Eliot Ness, his wife, Elisabeth and their son were returned to Cleveland, Ohio, for a classy and well deserved ceremony, in a city where he had worked so long to make it a better place. Unlike the three who criticized his efforts recently in the news, I think Eliot Ness deserves to be remembered for the overall good that he did. He certainly had more courage than many.